Announced earlier this week as Motorola's newest budget-friendly smartphones, the Moto E4 and Moto E4 Plus will be sold unlocked starting later this month (an exact launch date wasn't given). But what about carrier availability? Well, we can tell you that the Moto E4 will be available from Verizon Wireless at some point. While Motorola didn't explicitly say that the new handset was headed to Verizon, it did release a set of renders showing a Verizon-branded E4 - which, unsurprisingly, looks just like the variant that will be offered unlocked. 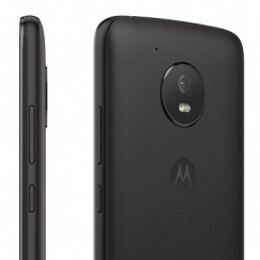 The Moto E4 is the smaller and cheaper model among Motorola's two new affordable phones, sporting a 5-inch 720p display and packing a 2800 mAh battery (while the Moto E4 Plus comes with a 5.5-inch 720p display and a 5000 mAh battery). The E4 runs Android 7.1 Nougat out of the box, further offering LTE, a Snapdragon 427 (or 425) processor, 2 GB of RAM, and 16 GB of internal memory. The handset has a fingerprint scanner, plus two cameras (8 MP on the rear and 5 MP on the front) with LED flashes. Unlocked, the Moto E4 will cost $129.99, and we assume Verizon won't ask more than that for it. All in all, this may be a nice device to get if you're on Verizon and don't want to spend too much money on a new Android phone. Right now, it's unclear if the Moto E4 Plus will also be offered by a US carrier. In any case, the unlocked versions of both the E4 and E4 Plus will be compatible with pretty much all relevant mobile operators. 5000mAh battery? 720p screen? Sounds better than most flagships now that any android phone has become powerful enough to run smoothly and do all the basics like browse the web and handle social media.